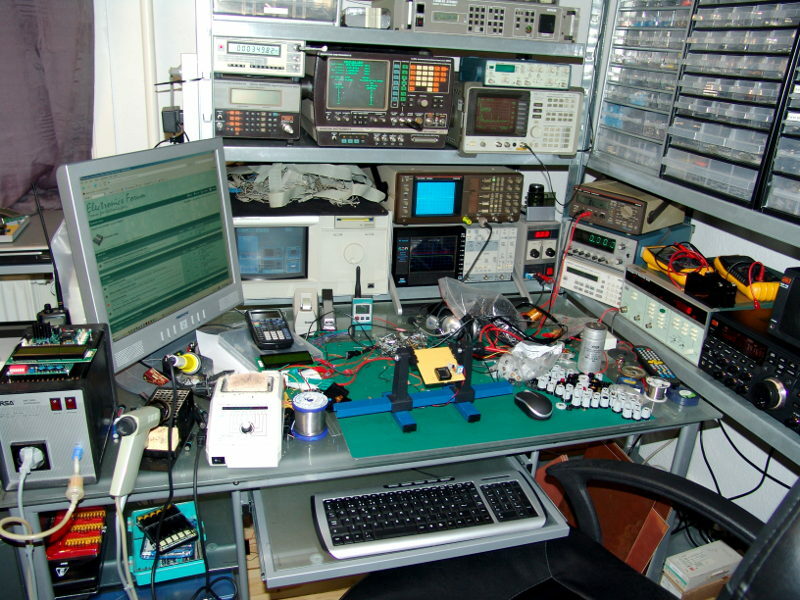 My workbench is a combination of some small electronics work and some wood working stuff. I made all the workbenches you see. two of them I put scrap pieces of laminate countertop on from where I replaced my kitchen countertops. Here's a pic of mostly everything. It's kind of hard to fit everything into one pic. The area I work on small things and electronics. The computer mount I fabricated. I couldn't find anything online in my price range to mount my computer so I made this one myself. It swivels and tilts so it works out great. I'd be happy to make you one too if the price is right. Well this is my place. I live in a one room apartment so I don't got that much space, but I put op a workbench in the corner and some shelves. 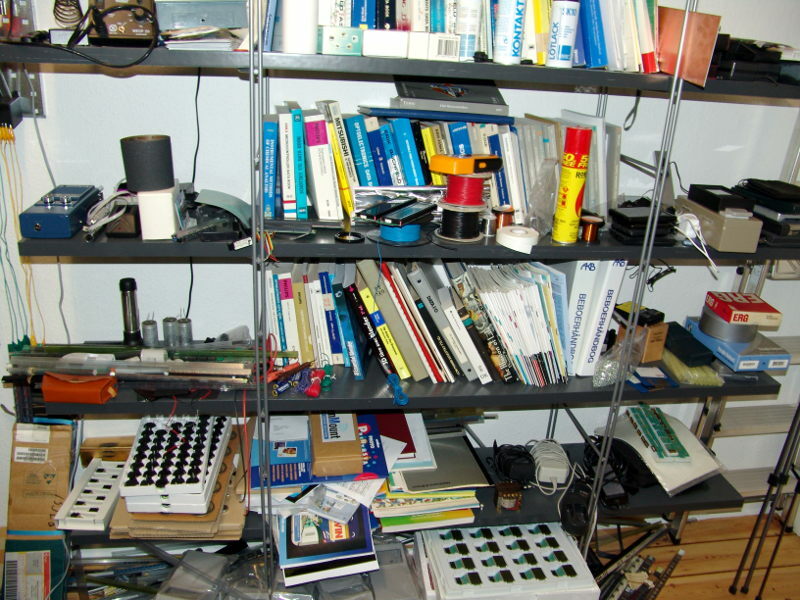 As you can see the shelves are filled whit various parts, projects, books and equipment. Behind my chair is a dresser with bigger parts and junk. 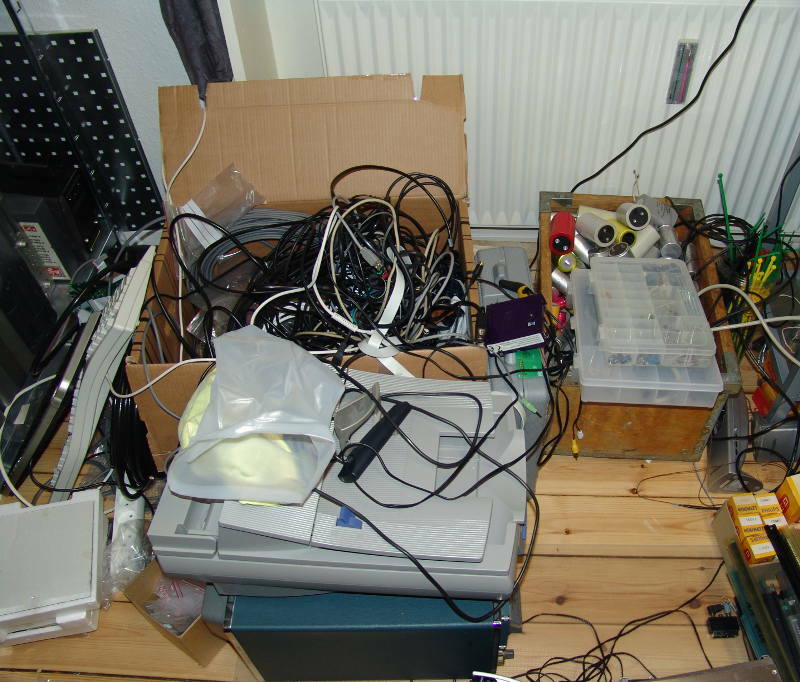 In front of me on the shelve is my access point and 500GB HD, my Tektronix 2245 100 MHz scope and the power supply i made as a kid, some of my frequently used tools, my printer and audio amp. On the table is a little storage draw with components, my soldering iron and multimeter, my laptop with dual screen, my headset and some trays with small parts. I got LED light under the shelve and to save space on my desk i put op a magnet to hold my scalpels and some hooks for cables and other things. I also started to put up jars for parts by screwing the lids under the shelves to get ride of some of the trays on my desk. Why only use one side of the shelves??? I put USB, parallel and serial ports up so i don't have to get behind my laptop to connect things like my Pickit 2 or Basicstamp. I got a folder for all my SMD components and a little table vice. The wiring is under my desk and behind the scope. It's all wired to a USB power saving so when i remove my laptop from the dock everything except my alarm clock shuts off. I got a backup 5V power supply for the USB just in chase I don't have my laptop. Hope you like it and got some new ideas. Apart from chandelier I've got only this small lamp in the corner. As a bench surface I've got a piece of wood-like tablemate. This is my audio corner with DIY preamplifier and amplifiers. This is my components storage and my study materials. And the last picture. The rest of my books, notes, materials and two toolboxes. 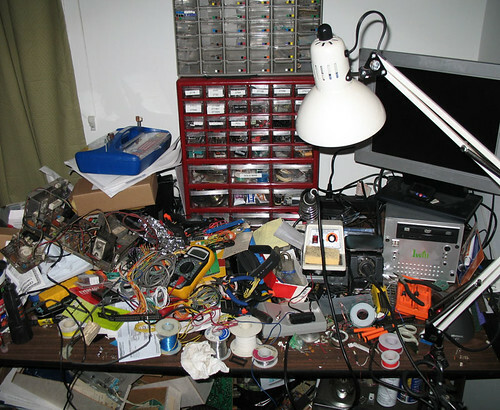 first a general view of my "clean" desk, where I do mainly electronic stuff, soldering and microcontroller programming. I also like big drawers where you can put lots of stuffs so that the desk is clean. and a range of electronic books always usefull to have on hand. there is a simple multimeter (the more efficient is on the bench), a precise lcr meter, a self built analog esr meter, a peak atlas semiconductor identifier, and some cables to experiment. you can see a usb pic programming module, an pic icd2 clone, an usb avr stk500 programmer, a freeduino and an avr butterfly. you can also see on the main desk a cypress psoc prototype board. I use the magnifying lamp when I do smd soldering, or when I want to have more light than the neon can provide. 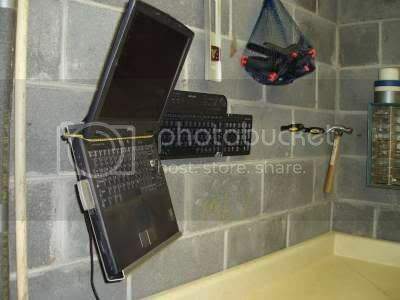 but the light actually is enought for electronics. it is a 20W 60cm neon bulb. I'm planning to add some useful measuring instruments directly accessible from the bottom of the bench: a small video screen to work easy with video signals, a audio signal injector and listener. I will put all these under the first "floor" of my bench. a view of all the electrics plugs, on the bottom of the first stair, they don't bother you there, they are accessibles, and there are plenty because you never have enought ! 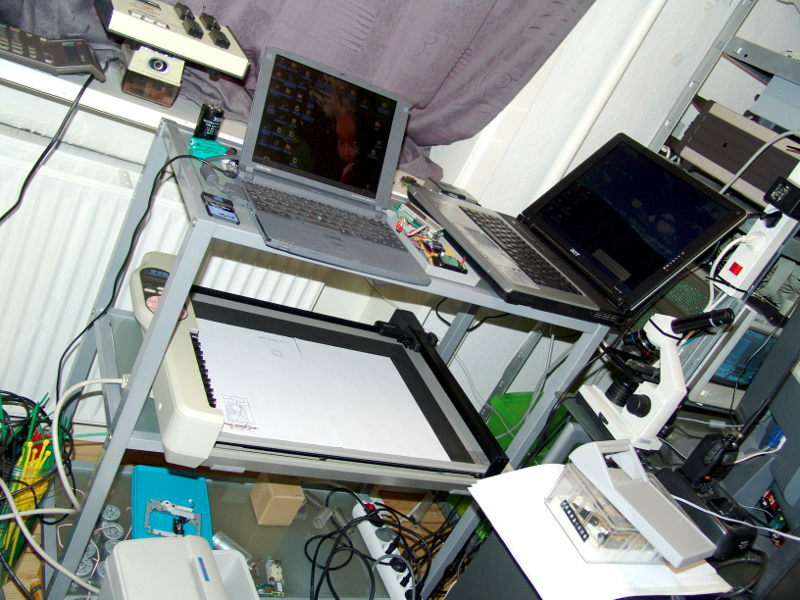 and here is my "dusty" workbench in another part of the home. here I do all the dirty stuff, wood stuff, drilling, everything that makes some dust. hope you enjoyed the visit ! 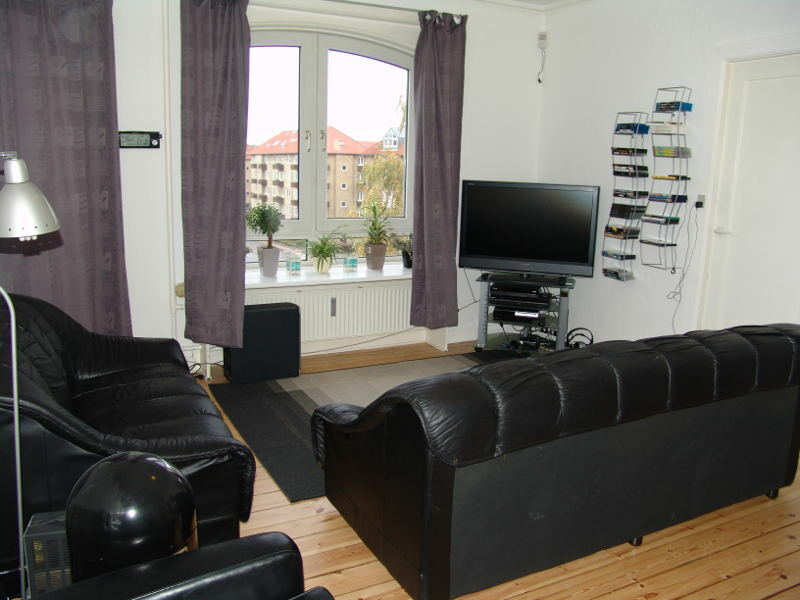 I was lucky to be able to fully renovate my house and command three of the rooms. I decided to segregate my mess. Paperwork and all the un-fun stuff goes in the office. 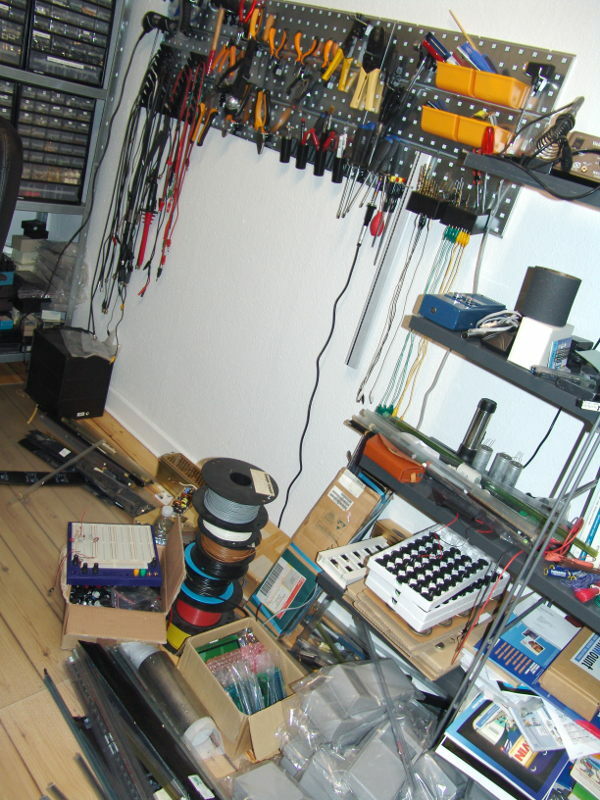 Electronics/sewing/computer/art projects (the clean stuff) goes in the 'Clean' lab in the attic. Bicycles, RC Cars, and all the dirty stuff does in my downstairs workshop, shown here. What did I spec for my workshop? I live in Singapore, which is 70miles north of the equator. That means it's always hot, I'm always sweating, and the tools are always rusting. That means I end up working at night, when it's slightly cooler. So I need bright mercury lights illuminating the porch. And a wall-mounted oscillating fan. I have a retractable canopy that keeps the heat off me during the day. Inside I have a ceiling fan that keeps the air fresh too. Rusting tools is a harder problem. I keep stuff wiped down with sewing machine oil and lately I've been using camphor blocks in the tool drawers, which is apparently an old woodworkers' trick. Dunno if it works or not. To maximize space, I made the "door" the entire wall -- it's a rollup shutter. I made a slope to the edge of the floor so that I can roll my rolling toolchests in and out of the room. The room is spartan, with a red epoxy floor and gray walls. The color scheme comes from my granddad's (a great mechanic with a terrific workshop) old battery charger. I always loved the red lightning bolts painted on the side of the gray box. This week I'm having adjustable shelving mounted in the back wall of the shop so that I can get some of the clutter up and out of the way. I hate piles. I'll owe you a follow-up picture I guess. 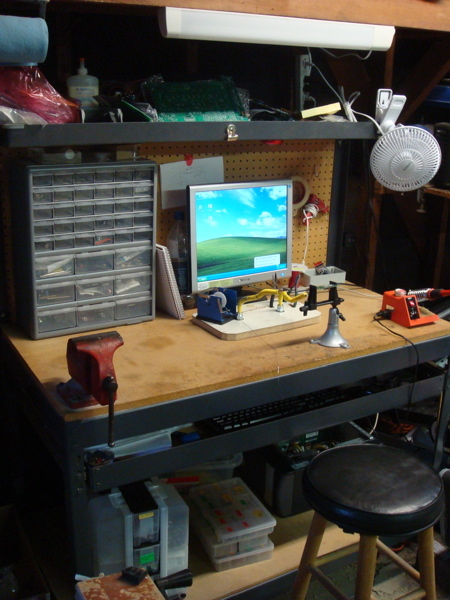 I work on everything from small RC cars to bespoke bicycles in the shop, so I am always using different things, moving in and out, so I actually don't want a massive monolithic workbench. When I'm working on RC, like I was when this photo was taken, I tinker at a round cafe-style metal table. When I am working on bikes, I drag the table outside and the park tool stand comes out. I had a massive, heavy steel plate welded to the bottom so that it is very stable. My tool segregation is simple... all general hand tools go in the tall chest on the left. All my bike tools and manuals go in the large Snap-On roller chest (mostly obscured behind planter boxes) on the right. One problem I have is figuring out whether a tool goes in the Clean Lab or the Dirty Lab. I realized at some point, each deserved some of the same tools, like screw drivers. The labs are still quarrelling over who gets the vacu-vise. Problems? I don't have a large heavy-duty vice yet. Why? Because I don't know where to mount it. I don't have a big monolithic workbench corner. Everything else is too lightweight. And I want 270� access at least, so mounting to a wall is not feasible. Other problems? 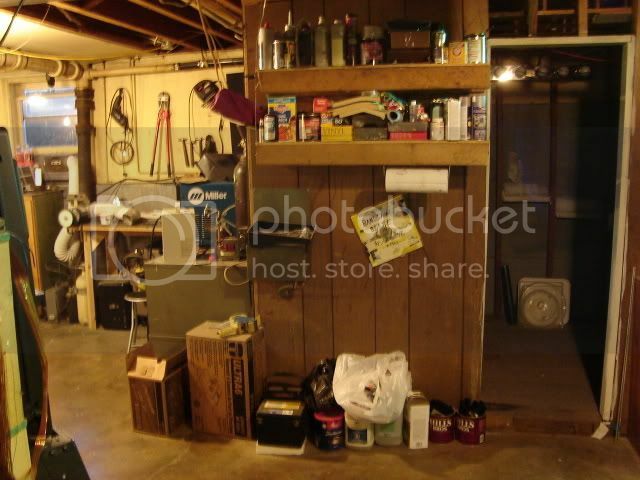 The same that everyone w/ a workshop has -- if you are not vigilant, it can easily become a bloated storage shed. What can I say, I'm messy. It gets like that with all the multitasking as I usually have several things to work on at any one time. Follow the Flickr link for more details of what is what. 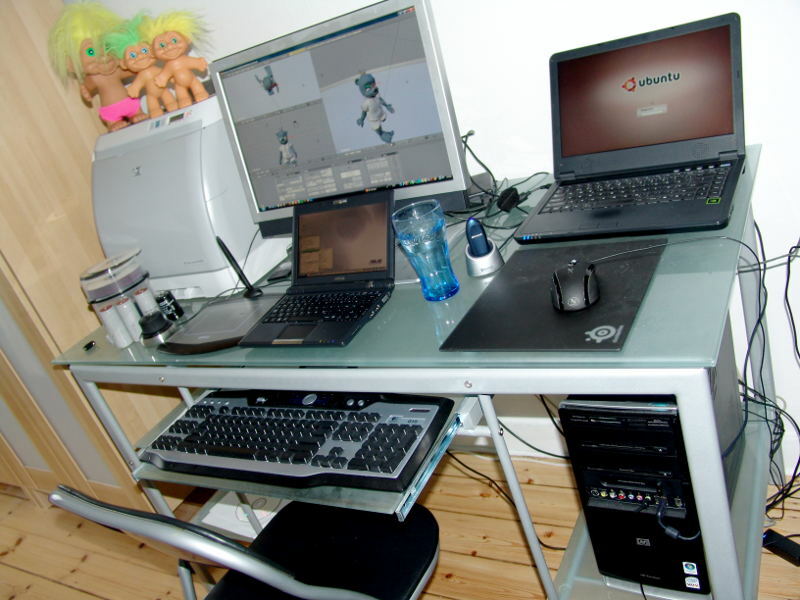 I'm a freshman in college now, but this was my work area/bedroom throughout high school. 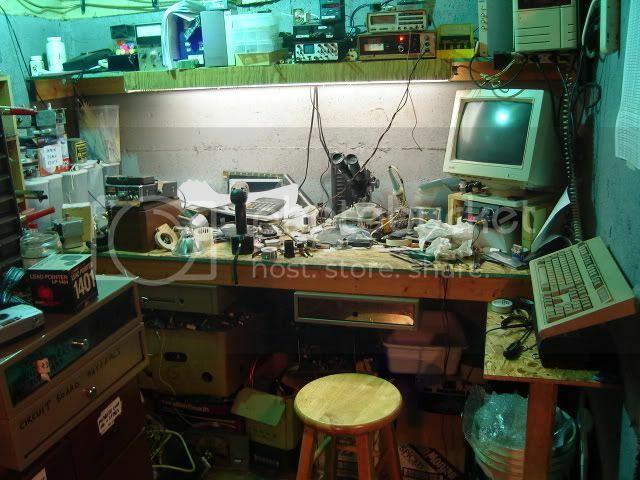 I've got the standard multimeter and soldering iron(s), plus a scope, JDM pic programmer, 3 computers (a laptop, a desktop, and an always-on server, though the server's headless, and both monitors are actually connected to the desktop), a modded Xbox running Evox with an upgraded HDD, and a 360 with hacked drive FW, all withing arms reach. My setup may be cluttered as hell, but it keeps all my most used parts within arms reach. In many cases, I can actually go from idea to finished device without leaving my chair. Power for all the equipment comes from 4 daisy-chained power-strips and a handful of those 3 plug residential extension cords all connected to a single outlet under the desk to the right. This pic was taken from my bunk bed, under which is most of my salvaged junk, wall warts, computer parts, spools of cable, a few odd appliances, that sort of thing. This is my main work area located in my garage. It contains all the basic gear. 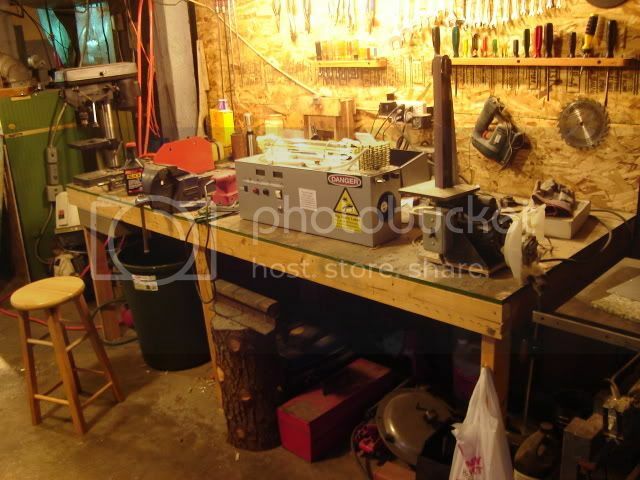 soldering iron, pc, parts organizer, bench vise, etc. Not shown is my oscilloscope, but it is just to the right of the frame. In the center you can see a homemade third hand tool which is much larger than your standard third hand tool. I recently bought the solder dispenser off of ebay for a couple bucks and it was really worth it. I had a diy one before and it was constantly coming off its tracks... I find that simple things like this can affect your efficiency in a major way. Which brings me to my second pic. My wife helped me organize the parts for a project that I have been repeatedly building... 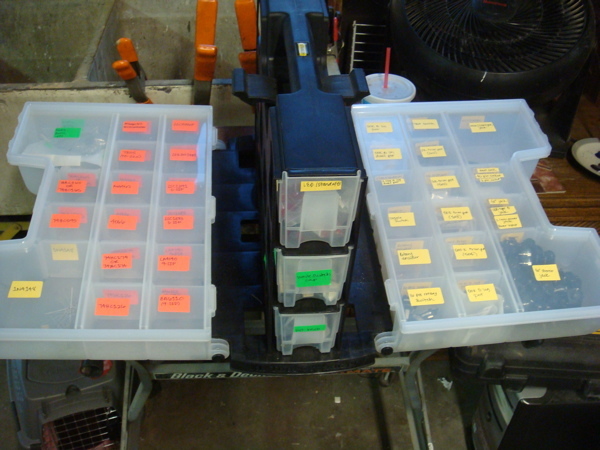 The color coded labels are a nice touch, and this system saves a ridiculous amount of time - most of it while unpacking and sorting orders from Mouser and Digikey but also during the actual build. 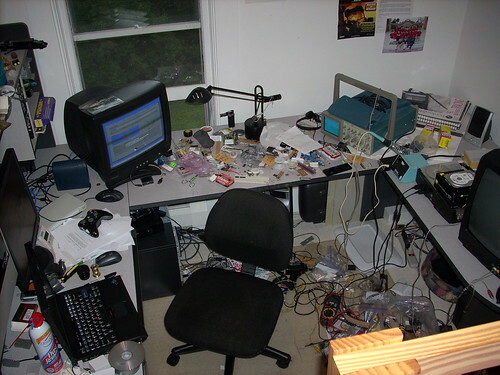 Ok, I guess it's time to reveal the Inner Sanctum for the contest. This is my main assembly bench, with the table saw off the end of it. 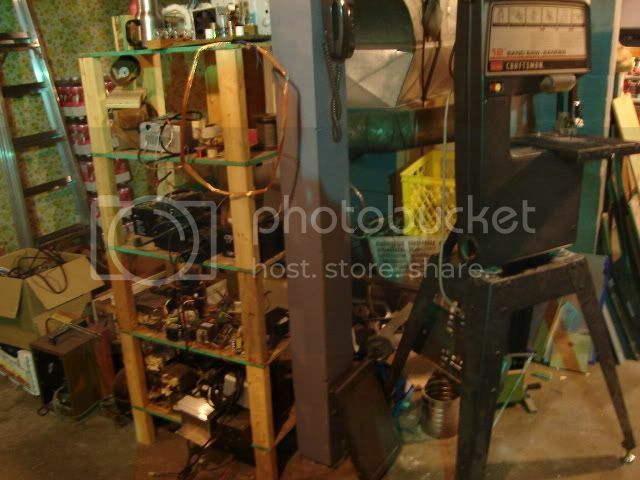 The machine in the foreground is a home built 1" precision belt grinder. The object on the bench is a 15W CO2 laser, a current project, almost finished. Underneath is tool storage, including a small generator & a hydraulic chassis punch set, up to 3". This is my electronics bench. It is my firm belief that those with ultra clean benches have too much time on their hands. Underneath the bench I store junk boards for parts, my copper stash, & my collection of cases, cabinets & project boxes. 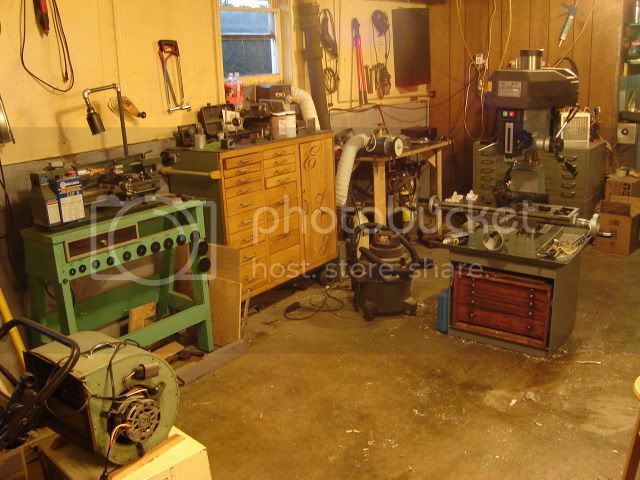 This is my machine shop area, including my custom built machinist's tool chest. I have a precision boring head for the milling machine, that allows me to produce holes of any size from 1/8" to 12", with accuracies within 100 millionths of an inch. 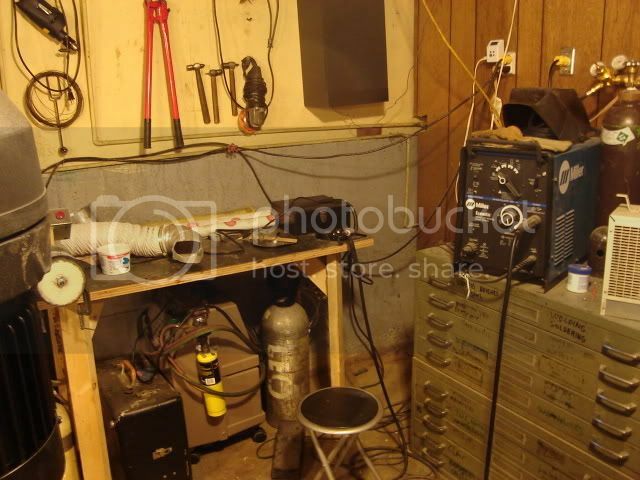 This is my welding area. 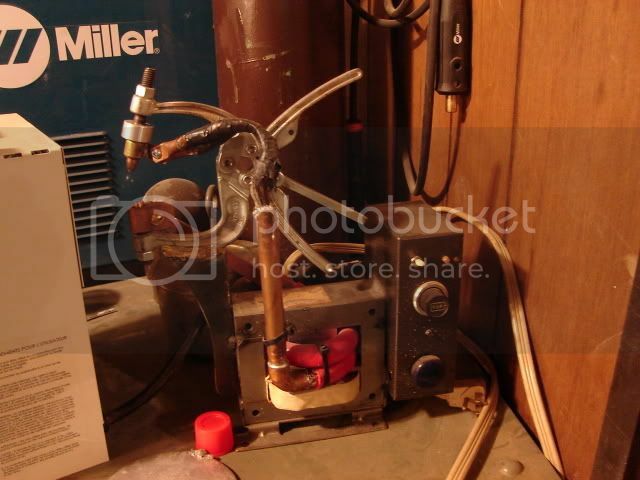 It has a Miller Econotig TIG welder, a suitcase oxyacetylene rig, & my oxyMAPP brazing torch & oxygen concentrator machine. I am equipped to weld any metal known to man, other than radioactives. 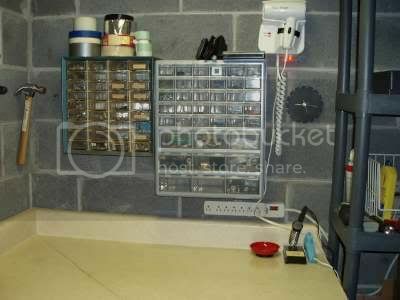 The gray cabinet under the welder is a tool cabinet, which contains just about every known hand tool. Another welding machine. This is a MOT based home built resistance welder. I use it for spot welding thin stock & wires. This is my bandsaw, which has been heavily modified in order to cut steel up to 3" thick. Also shown is my transformer & magnet wire stash. This is my main parts storage area. All components are sorted by value & type. One lower drawer contains my boxed hardware, screws, nuts, washers, etc. 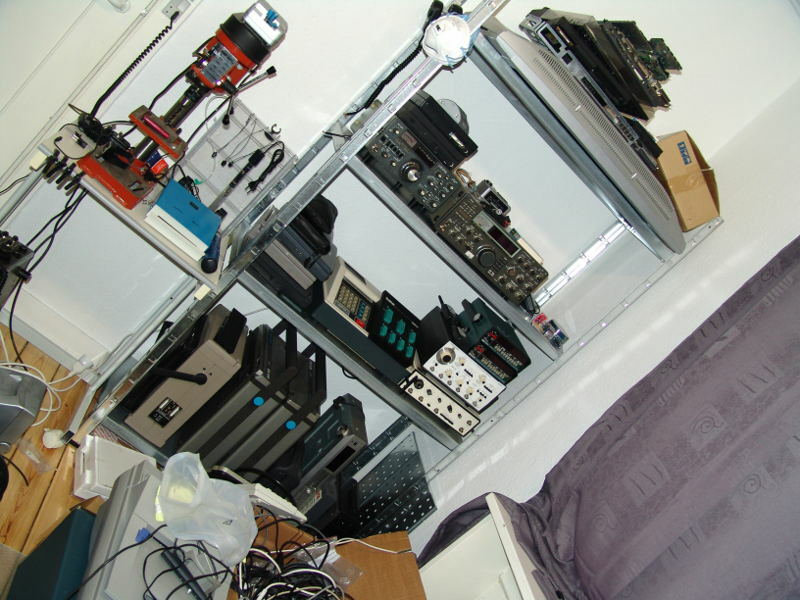 A parts mine, where I keep stuff to be junked for parts, & larger hackable assemblies. This is where I store my shop supplies. 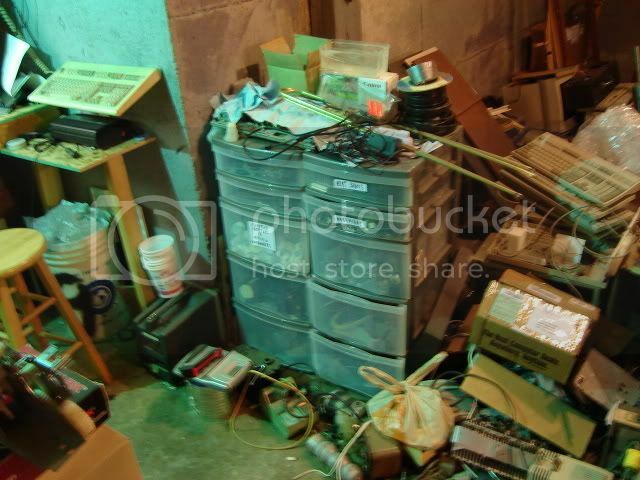 Chemicals, solvents, paint, epoxy, brushes, etc. 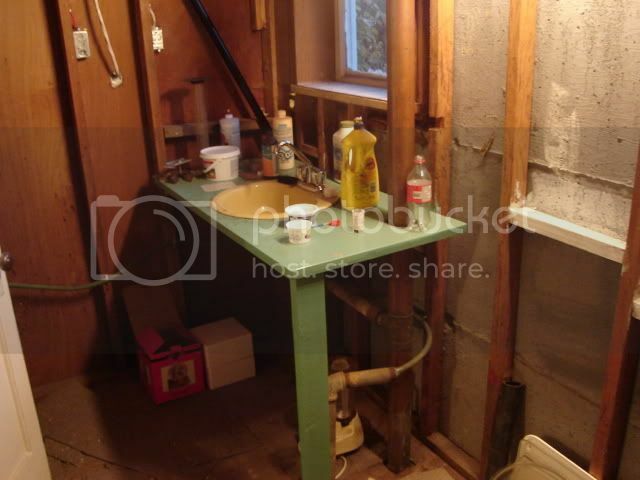 And last, my washup area & fledgling chemistry lab. In addition to this, I have a comprehensive collection of hand power tools, as well as many air tools, including a precision die grinder that turns at 100,000RPM. I also have taps & dies for most threads under 1/2", including pipe threads. That's about it. This is where I create. Of course, a workshop is an evolving system, & mine is only 3 years old. I have many enhancements planned. and the other to handle the rather old Plotter. and handy when working controllers & other stuff. is some free space....junk gets in. Oh well - that was my Entry. Hey, folks. With all the amazing benches in this thread, my post should be deleted by the next moderator that passes by. 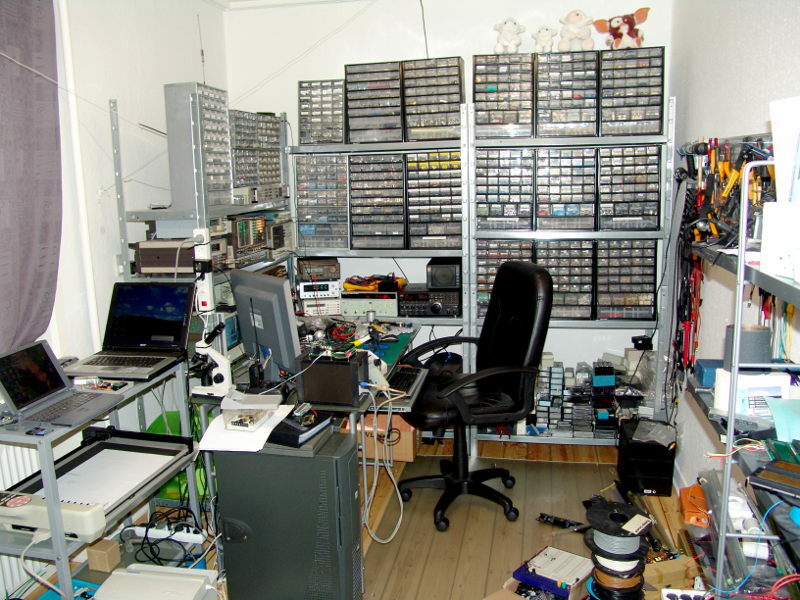 I'm just a hobbyist, mostly into PIC micros for low level hardware hacking. My very modest bench reflects this. So there's no fancy equipment, but there are a few little tricks that I think are pretty neat that I wanted to share. Plus I didn't see anyone else who had an ANVIL! To sort/store my various microcontrollers and other IC's, I came up with this solution. I cut the rack out of plexiglass and hotmelt glued it to the side of my refridgerator - which turns out to be a perfect fit. To eliminate some wires, I put a regular USB port on my programmer so it plugs right into the side of my monitor. I also commandeered the programming button and routed it to a widened output port. My transition to surface mount parts was a bit rocky, but I finally got a handle on it by using a test tube rack. Above it, you can see a small rack of commonly used solvents and machine oil in handy squeeze bottles. On the left you see how I keep hotmelt glue always on tap with a glue gun modified to sit directly in a power strip. One of my most useful "mess eliminators" turns out to be my DIY impulse sealer. I found I could bag and tack stuff right onto a cardboard "wall." When I run out of room, I target the stuff that's been dormant and put it away somewhere more permanent. Some of the most simple tricks turn out to save me the most time. Here's a drill holster I made by heating some foam board. I can leave even the finest bits in the drill without fear of breaking them. ... and here's a another simple trick that saves me lots of time. I keep some "epoxy balls" hanging off of a couple lengths of teflon wire. This keeps them from sticking to anything until I need them. In this case they're hanging from notches on my DIY LED lamp. In the back row is Magic Sculpt, a.k.a "Permanent Blu-Tac." In the front row is Kneadatite, a.k.a. "Gum-crete." If it ain't broken, just gimme some more time with it. Custom bipolar power supply powering Wein-bridge oscillator and PIC. 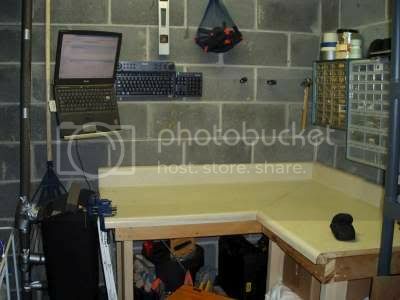 My workbench is spread out on two sides of my garage. It has electric outlets on the walls every five feet and a large electrical strip on the front of the work benches. There is also a 220 volt outlet. The lighting is amazing with multiple fluorescent light fixtures over all the work benches and there is a furnace to keep warm. There is compressed air piped through the whole garage. Sadly, I only have 2 good voltmeters for test equipment. If you can get an Oscilloscope, it would help you greatly. 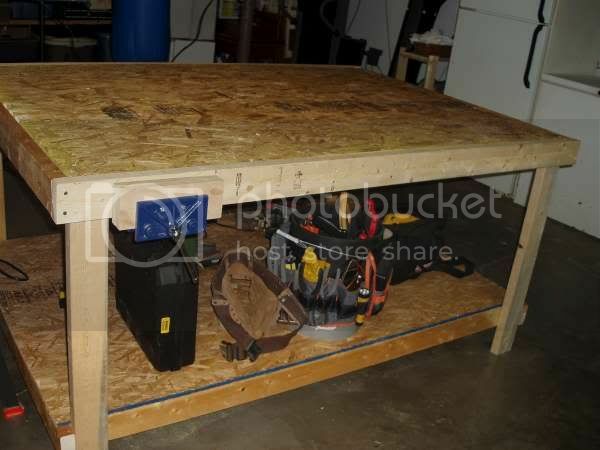 For storage space, I have a tool chest for electrical tools and boxes under the benches filled with spare parts and more tools. 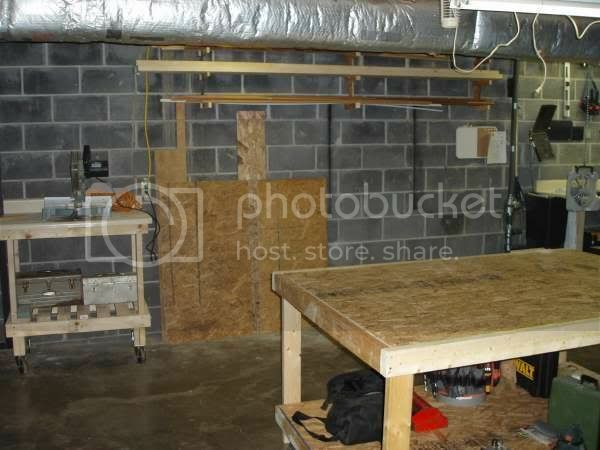 There are also shelves above the workbenches for more supplies. For storing electrical components, I have some jars. If you can, get a compartment cabinet. 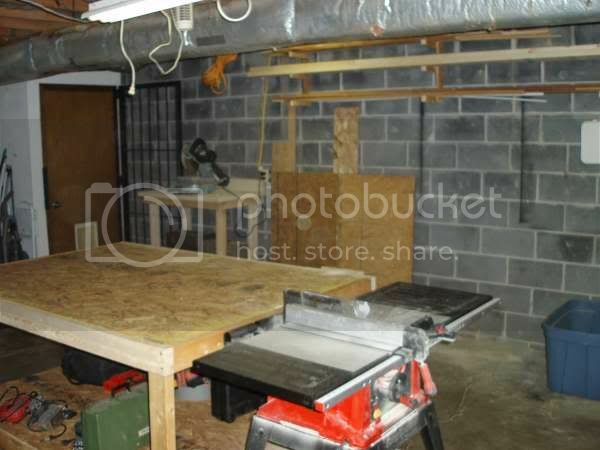 I have plenty of counter space with a workbench spanning each side of the garage. 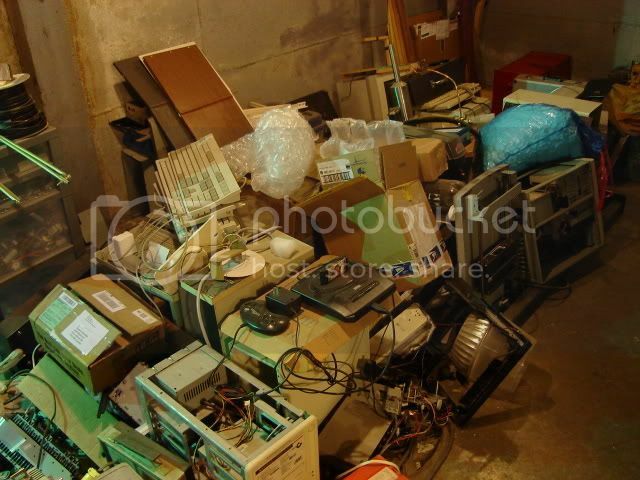 Of course, it�s commonly covered with tools and projects. Soldering tools and supplies: iron, solder wicking, solder sucker, solder, sponge, and helping hands. Screwdrivers and pliers. For electrical work I use my smallest tools. There is a sink with cold and hot water next to the workbench. This is nice for wetting the sponge I use for soldering. 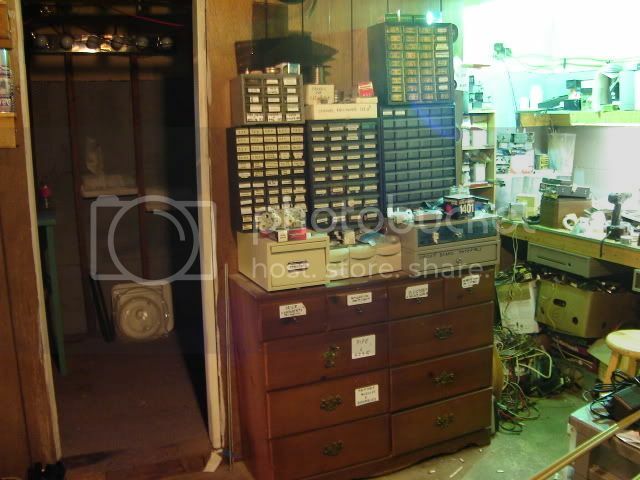 You can also see the boxes I use for storage under the workbench. Some of my favorite tools are the tools I use for manufacturing components. You can see them in the picture above. 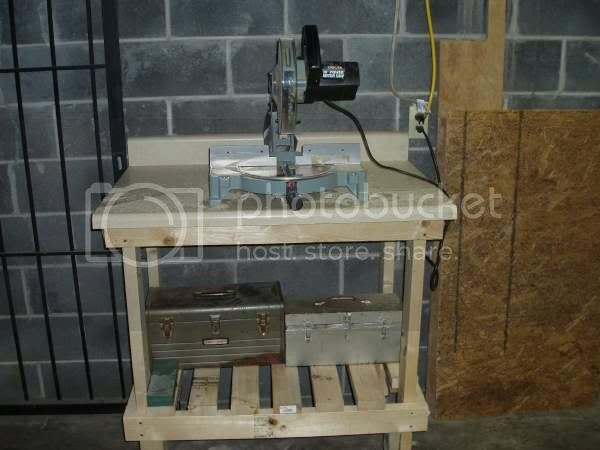 The drill press is nice for any drilling needs and the vice is a must have for bending and holding objects. The vice and drill press will not help you make high precision metal objects; that�s where the sheet metal machine comes in. This machine shears, bends, and slip rolls. I also have tools for heavy metal working like a welder and plasma cutter. The plasma cutter can cut through extremely thick metal. 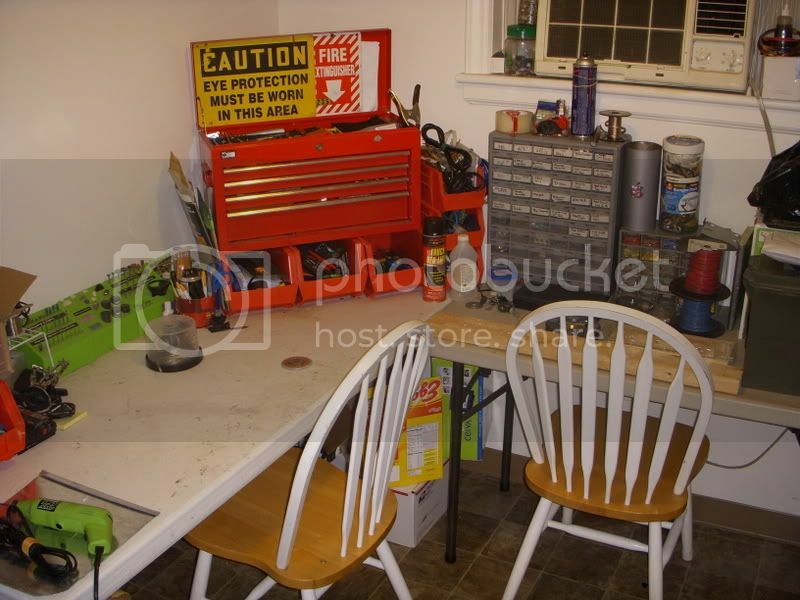 I hope you liked my workbench/garage!